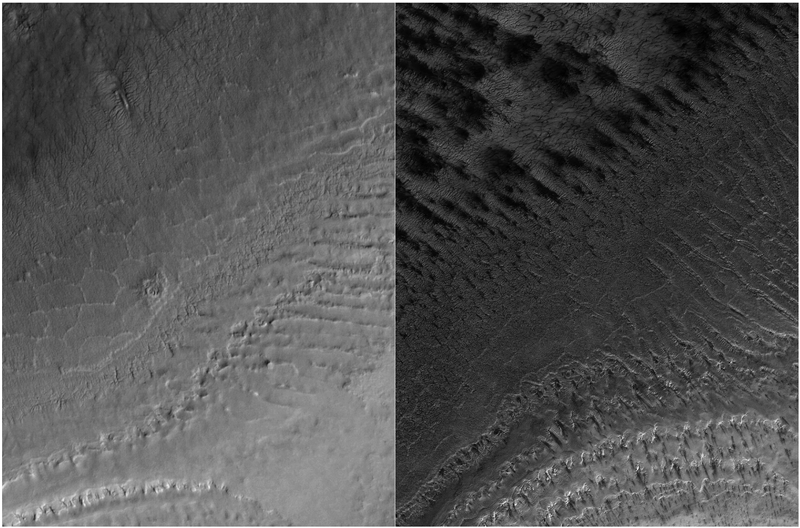 A comparison of an image from CTX (left) versus HiRISE (right) for the same region of the Martian surface. This comparison shows what it’s like to view the surface of Mars through two different cameras on board the Mars Reconnaissance Orbiter. On the left is an image from the Context Camera (CTX), which is used to get lower-resolution pictures (6 metres per pixel) of larger areas of the Martian surface, providing context for images from the higher-resolution cameras on board. The right-hand image is from one of those cameras, HiRISE (50 centimetres per pixel). CTX provides the images that are classified by volunteers on Planet Four: Terrains, and this specific one was identified on Talk as a good candidate to follow-up with HiRISE in order to examine the features in more detail. You can explore the full-resolution HiRISE image at hirise.lpl.arizona.edu/ESP_047718_0995.